It has now been over 5 years since The Found Generation was launched in April 2012, at the height of the UK’s youth unemployment crisis, to tackle youth unemployment and prevent a so-called ‘lost generation’ of unemployed young people. Since we have launched we have achieved a great deal despite our limited time and resources – winning a number of awards; preparing a comprehensive, youth-led programme of policy proposals; giving evidence to a number of official inquiries (most recently giving evidence to an inquiry run by the Work and Pensions Select Committee); and giving young people a voice at many conferences, debates, discussions and meetings on or relating to youth unemployment. However, we are run by a group of volunteers, who inevitably have many other commitments on their time. The picture on youth unemployment is also very different now than it was 5 years ago. For example youth unemployment is now much lower than it was in 2012, and there is now a cross-party political forum in place to facilitate discussions with politicians and decision-makers on this issue, in the form of the All Party Parliamentary Group (APPG) on Youth Employment (our first ever campaign called for the creation of an APPG on this area). It has therefore become increasingly clear that it is long past time for us to pause, take stock, and spend some time carefully considering the best way forward for the group and those involved in it. As part of this process we will therefore be scaling back some of our activities in part for at least the next few months. However, this does not mean we will be stopping all activities during this period. So for example we will continue to engage with, advise and support key stakeholders such as Youth Employment UK and the APPG on Youth Employment; and we will continue to push the need for further action on youth unemployment and social mobility where we can, including through our Twitter page. Further, if you have any ideas or are interested in supporting us or engaging with us, you are of course more than welcome to continue to contact us. On 5 December 2016 our co-founder and Director, Andrew Scott-Taggart, gave formal witness evidence in person on behalf of The Found Generation to the House of Commons Work and Pensions Select Committee, chaired by Frank Field MP. This was for their inquiry on Employment opportunities for young people. During the hearing Andrew spoke alongside Peter Little OBE, and Carole Easton, Chief Executive of the Young Women’s Trust, and answered a number of challenging questions from the MPs present. Their evidence was the second part of the hearing – the first part of the hearing involved the Committee hearing witness evidence from the MyGo youth employment centre in Suffolk and two of their service users (this is an initiative which we highlighted in our Manifesto in 2015 and recommended that the Government expand to other areas of the country). Andrew was invited to provide witness evidence after submitting written evidence to the Committee in September 2016. The invitation was made on the basis that The Found Generation’s written evidence included a number of useful, practical suggestions which the Committee wished to consider further, and that we were a particularly appropriate organisation to give further evidence by virtue of being a youth-led organisation. To be invited to give evidence to a Parliamentary Select Committee was a great honour for us and is a testament to our hard work over the last few years. It is also significant that, unlike many of the organisations which normally give evidence to Select Committees, we were invited to do so despite not having any staff – we rely entirely on volunteers – and despite having very limited funding and limited experience of submitting evidence to these sort of inquiries. This is a welcome indication that we can, and do, punch above our weight in the debate on youth unemployment and promoting opportunities for young people. The video footage from the hearing is available from the Parliament website. The minutes of the hearing have also been published and can be found here or here. The written evidence is available on the Parliament website under reference EOP0054 or from our website. 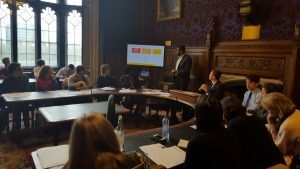 We were in attendance at the latest meeting of the All-Party Parliamentary Group (APPG) on Youth Employment on 19 October 2016. This meeting was the initial meeting of their first inquiry on youth unemployment data, which included a presentation from Jatin Patel of Impetus PEF, talking about their Youth Jobs Index, as well as a wider discussion of the topic. We contributed our thoughts to the meeting, including that the range of official statistics and data which are currently available (e.g. the ‘unemployment’ figures, the ‘NEET’ figures, the ‘claimant count’) do not always tell the full story or give a full picture about youth unemployment. For example we noted that if statistics suggest the number of young people on unemployment benefits such as Jobseeker’s Allowance is falling that will usually be seen as a positive development, and rightly so. However, those statistics would focus on whether a young person has come off benefits, not whether they have gone into work – and the two situations are not necessarily the same – a young person may have come off benefits but still be unemployed. So for example, we noted that some young people may still be unemployed but may be coming off unemployment benefits (or not going back onto them when they need to) because of failings of Jobcentre Plus and/or the benefits system. Further, the majority of young people who are unemployed and who are not full-time students do not claim Jobseeker’s Allowance or Universal Credit. This means these young people, nearly 250,000, are therefore not registered with Jobcentre Plus for official help with their search for a job, and at least some of them are likely to need some sort of support. More information on the meeting and this year’s inquiries is available via the Youth Employment UK and APPG websites.